Wine, Cheese & What a View! Two weeks 83rdago, I was invited to Fifth Town Artisan Cheese when owner, Patricia Bertossi, was partnering with fellow Italian Canadian, Pat Del-Gatto, to give a sampling of the new range of Fifth Town Cheeses paired with Del-Gatto wines. Patricia’s grandfather had been a cheese maker in Parma Italy and Pat’s Italian forbears were winemakers so both of them were delighted to be carrying on the family tradition with Canadian modifications. Pat Del-Gatto is a great believer in growing what was intended to grow in this climate and so his wines are very different from the Chardonnay and Pinot Noir that are standard fare at most County wineries. Hardier vines like Vidal, Seyval, Geisenheim, Leon Millot, Frontenac and Baco Noir are his strong suits; although this year, he has an excellent Riesling and Riesling blend from grapes grown from a neighbour’s vineyard. He has a planting of Pinotage coming along nicely as well that should be released in 2016, the first of its kind in the County. Patricia Bertossi has been importing artisan Italian cheeses while waiting for all her licences to start making Fifth Town’s celebrated craft cheeses again. In June, they all were approved and she now has a range of goat cheeses from spiced chevres that are perfect bagel cheeses, Lemon Fetish that crumbles beautifully on a salad, Operetta and Lost Lake that ooze like brie for spreading on crackers and their local favourite Cape Vesey with its washed hard rind. We bought the Dill Chevre, Operetta and Cape Vesey. A group of twenty of us took part in the wine and cheese pairing and thoroughly enjoyed the afternoon. The cheeses are beautiful and the Del-Gatto wines were excellent in the pairings. Del-Gatto is a small batch winery and I’ve made the mistake in the past of getting there for Wassail. They are sold out of their most popular wines by then. Now, is a great time to buy Del-Gatto wines and this year’s offerings are the best I’ve tasted from them. I bought the Riesling and Colin bought the Baco Noir. The Cape Winery opened its doors the weekend we visited. Located between Del-Gatto Winery and Fifth Town on County Road 8. It’s very new and so were the wines but they are a young family with time to grow. I bought a bottle of the Vidal and another wine writer, Joe Haché who was visiting while I was there, picked up a bottle of the pinot noir. I see that Fifth Town Cheese will be hosting the premiere weekend performances of Festival Player’s young company All for Beaver Hats from August 1-3 starting at 11:00 am. The play costs $10 and lasts about 45 minutes. Another reason to go visit this weekend. Click on the link above for a complete list of all the locations in the County where it is being performed. 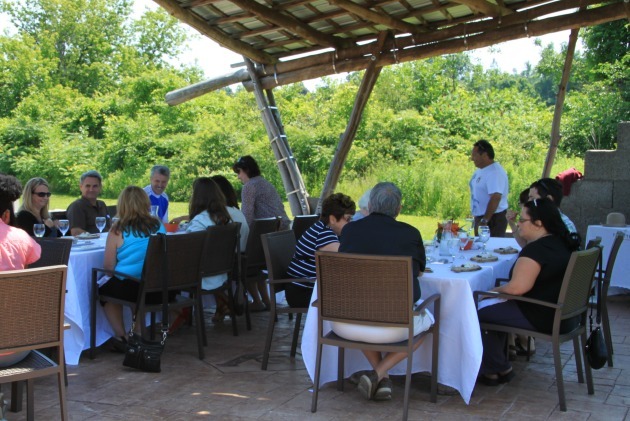 The lunch options have expanded this year in Cape Vesey. 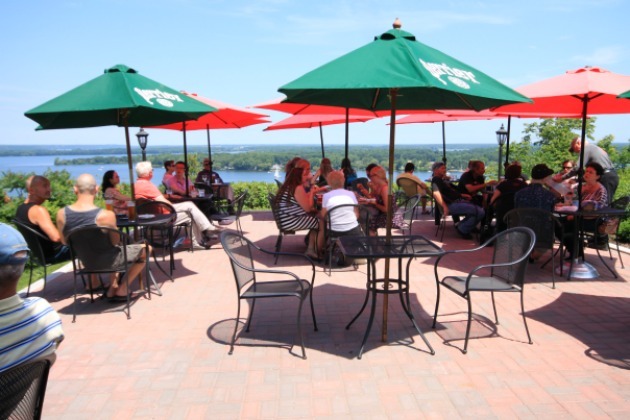 Waupoos Winery’s Gazebo and County Cider patio, have spectacular views of Prince Edward Bay and lovely dining experiences. Clafeld Fruit Winery and Market just across the road from Waupoos also sells light luncheon fare. Del Gatto is selling light lunch fare to have with a glass of wine on their patio. On the other side of the Cape, on County Road 7, Inn at Lake on the Mountain has been a favourite lunch spot but tended to be a more formal meal. In contrast, they’ve opened The Miller House Bistro across the road, with a large fresh air patio that has a breathtaking view of Adolphus Reach and serves charcuterie platters. Just up the road is one of my favourite wineries, The Devil’s Wishbone, which has added an outside patio tasting bar and people are encouragied to picnic among the vines. 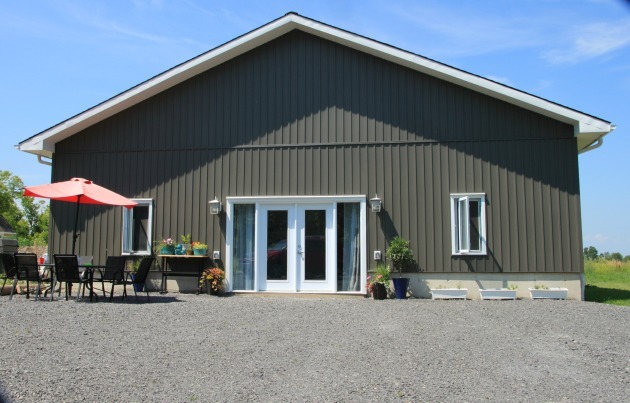 Waupoos Winery has become very kid friendly these days with a petting zoo across the road next to Clafeld Market and a fully stocked candy store and chocolatier which also has homemade gelato to the side of the main winery tasting room.. This year, they have added Pioneer to their wine list, a tribute wine to their founder Ed Nauser who opened Waupoos as the first commercial winery in Prince Edward County and trail blazed through all the red tape to make it happen for the thirty-five or more wineries who have followed. This is a glorious area of the County to visit during the summer. So much to do and see. What’s your favourite stop in Cape Vesey? Please comment below and share on Twitter or Facebook. I love Fifth Town Cheeses. Glad to hear it’s operational again, as they certainly had some magnificent flavours. She’s also continueing to sell her imported Italian cheeses through the retail shop as Fifth Town International. Some of these cheeses were amazing and you’d get them no where else. Ah, I am so jealous. This sounds like it was a lovely outing, and a great pairing of wine and cheese. It’s great that Fifth Town is up and running and getting so involved in County festivities. Maybe we’ll get a chance to get down there soon. This is a great blog, Veronica. I enjoy your sense of taste and adventure!